My name is Ricardo Bordignon Medina. 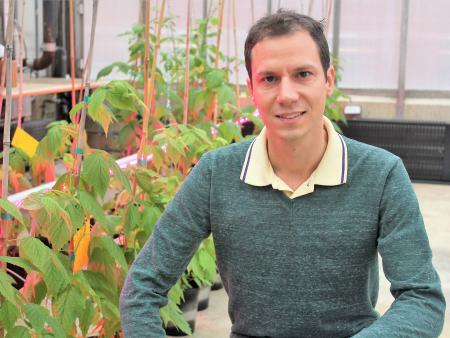 I’m a Brazilian citizen and a current Ph.D. candidate at the University of São Paulo’s (USP) Luiz de Queiroz College of Agriculture, specifically in the Plant Physiology and Biochemistry Program. I’m also currently a visiting scholar at The Ohio State University, researching small fruits in controlled environments in the Department of Horticulture and Crop Science (HCS). After receiving my B.Sc. in Agronomy from USP, I worked for a Brazilian company developing a methodology to estimate industry costs of orange juice production to be used as a price indicator for the minimum price paid for orange growers. Soon after, I began my M.Sc. in Horticulture researching blueberries grown in warm subtropical regions under modified environments. Berry, including blueberries and raspberry, cultivars commonly grown in the subtropical region in Brazil do not need to undergo a cold winter to properly develop their flower buds, and subsequently break the dormancy for their normal growth and development to occur the following season. On the other hand, cultivars in Ohio and other temperate regions do have to undergo a cold period before they can break dormancy, flower and fruit properly. Interested in furthering the research on small fruit production in non-traditional regions and off-season harvesting, I continued on to begin my Ph.D. program working with raspberries in warm subtropical regions of Brazil. But in order to broaden my research to more temperate zones and the utilization of controlled environment production systems, I began looking for international partners with whom I could effectively advance this research. Since August 2018, I’ve been at The Ohio State University as a research scholar developing and implementing a project focused on growing raspberries inside greenhouses under light-emitting diode (LED) lighting. This is a joint project between Dr. Gary Gao’s fruit production systems research and Dr. Chieri Kubota’s controlled environment research. I was drawn to work at Ohio State when I initially came across a number of Dr. Gao’s publications on small fruits. His work interested me, so I reached out to him expressing my interest in conducting my dissertation research with him. The experiment that I and Dr. Gao designed in the HCS greenhouses sought to build upon earlier research conducted on controlled environment production systems. During the autumn and winter months, the low temperatures and scarcer sunlight can be limiting factors for raspberry production in higher latitudes (e.g. the Midwest of the U.S.). As a result, raspberry plants grown in conventional field systems lose their leaves and enter dormancy. 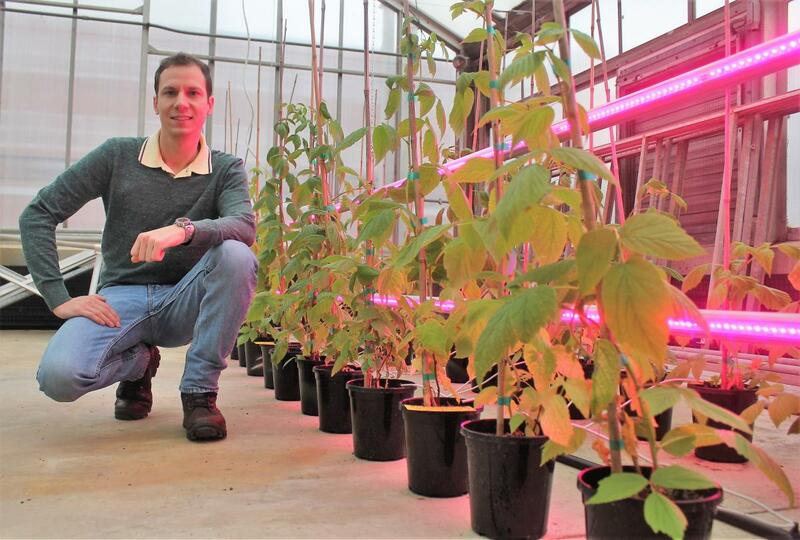 My experiment at Ohio State involves growing raspberries in greenhouse conditions using container substrates and intercanopy red/blue LED lights as supplemental lighting. With the warm temperatures inside the greenhouse and the supplemental light provided by LED light bars, it is expected to lessen the likelihood that these raspberry plants enter dormancy. The experiment has three treatments of varying LED light intensity: one treatment with two layers of LED interlighting bars; another treatment with a single layer of LED inter-lighting bar; and a control group with no artificial light. In addition, 2 cultivars of raspberries are being tested across these treatments, considering their different fruiting habits. Plants in each treatment will be tested for growth rate, harvest period, yield and fruit quality within marketable parameters, as well as nutritional quality, such as phenolic compounds content, antioxidant activities, and profile of secondary compounds. Ultimately, I am hopeful that this project will yield data that will allow growers to explore year-round raspberry production in high latitude regions utilizing controlled environment systems. It may also confirm the hypothesis created in Brazil, where no chilling hours are required for growing raspberries. This could expand the production range of raspberries not only to warm temperature regions (i.e. those not requiring chilling hours), but also to high latitude regions using controlled temperature and LED supplemental lighting.